Breaking Developments in the Oregon Standoff Trial | RANGEfire! Juror #4 Issues a Statement via The Oregonian/OregonLIve: Government Failed to Meet Its Burden of Proof. 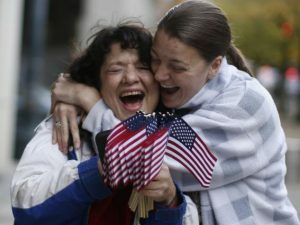 “It should be known that all 12 jurors felt that this verdict was a statement regarding the various failures of the prosecution to prove ‘conspiracy’ in the count itself – and not any form of affirmation of the defense’s various beliefs, actions or aspirations,” Juror 4 wrote Friday in a lengthy email to The Oregonian/OregonLive. “All 12 agreed that impeding existed, even if as an effect of the occupation,” he wrote. BREAKING NEWS: 4:15 p.m. PDT — ALL DEFENDANTS ACQUITTED — FOUND NOT GUILTY — of ALL Criminal Conspiracy & Gun Charges. More details later. It’s worth watching John Lamb’s reaction on Facebook. IN FURTHER BREAKING NEWS, it has been reported now by multiple sources that in the chaos in the courtroom following reading of the verdict, Attorney Marcus Mumford was attacked, tackled and tased by U.S. Marshalls. More details on that later too. According to multiple sources, when Attorney Marcus Mumford attempted to argue that his client, Ammon Bundy, was acquitted and should be released as Defendant David Fry will be, multiple U.S. Marshalls took Mumford to the ground and tased him in the courtroom. As the Oregon Standoff Trial jury is starting deliberations from scratch, the Defendants have filed a request to have an additional jury instruction given regarding Second Amendment Rights, that they had previously requested. According to the language of the motion, this new request was filed based on the defendants’ assertion that the Government breached the assurances it had given both to the court and to the Defendants prior to its rebuttal case and closing arguments that it would not mention “Militia” or make any attempt to tie the so-called “Militia” and their guns and actions to the defendants. To review Defendants’ Second Amendment Jury Instruction Request, CLICK HERE. 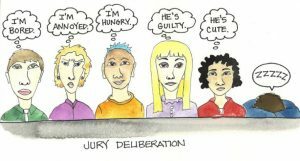 When Judge Brown instructed the newly-configured jury to begin deliberations from scratch, including selection of a new foreperson, she told them to completely disregard any previous deliberations as if they had never happened. She declined, however, to however, to give the jury Defendants’ newly re-requested Second Amendment Instruction. “Wasn’t our job”? “We have a college student (juror)”? — Who’s posting this stuff? Members of the jury? Court staff? Prosecution? “Sure wish the jury had not sprung a leak“? Is there more to that story? Is there much more to the whole equation than meets the eye. The jury in the Oregon Standoff Trial began deliberations last Thursday (Oct. 20, 2016). 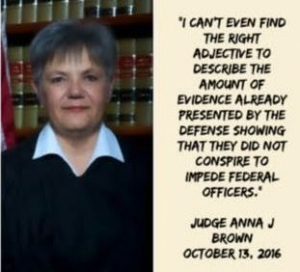 Yesterday, separate jurors passed notes to Judge Brown expressing concerns and asking questions, indicating that the jury was in deadlock, and that one of the jurors, a former BLM employee, who had underreported his biases during voir dire examination, had expressed an admitted bias at the outset of deliberations, but nothing had been done about it. The defendants filed a motion to dismiss that juror — Juror No. 11 — or declare a mistrial in the case. To review Defendants’ Motion, CLICK HERE. This whole scenario also raises all kinds of questions about the possible tainting of the rest of the jury by Juror No. 11’s admitted biases, and whether or not he may have presented addtional information to the jury beyond the scope of the evidence presented during the trial. The rest of the story is that in addition to being a former BLM employee, Juror No. 11 is also a current law enforcement officer, with the department of corrections. How did he get past Voir Dire questioning? Obvious masking of his background, connections, and biases? Possible broader tainting of the rest of the jury? Lots of questions, but here’s one of the biggest: Why isn’t the Mainstream Media telling the whole story? After much pushing with plenty of case law to support the motion, despite considerable resistance, Judge Brown finally dismissed Juror No. 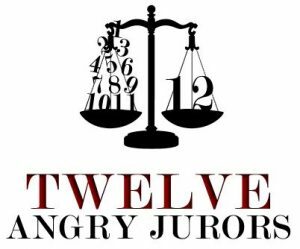 11, forcing her to randomly select an alternate juror. Alternate Juror #18 was selected. Judge Brown then dismissed the jury for the day. Jury deliberations will start over again FROM SCRATCH, beginning tomorrow. For Maxine Bernstein’s treatment of this issue, CLICK HERE. For more RANGEFIRE! coverage of previous trial developments, CLICK HERE. In loving memory of LaVoy; God bless our Republic. Go to Section 5 United States Defined. Careful reading of the statute indicates that it is within the confines of the constitution. Where is Lavoy’s mention or picture in the news ? Lavoy did not die for nothin.